thank you!!! just what i've been waiting for!!! btw, do you have any cute buttons like your strawberry ones to go with this too? I love this template! I am going to use it! I'm using it too...miaowwwwwww.....it looks so cool.. I can't download it.. what's wrong? I'm not usually the cutesy tootsie kind, but I really like this. Good job. I've downloaded your template, and am using it although with some major changes. In fact, there's no cat and no paws anymore ehehe, hope you don't mind the mess i've made with it! Credits for your excelent work are there of course, because i've just changed the size of main blog body sidebar, and the images are simply boxes :) to match the name of my blog. Thank you so much, and hope you don't mind what I did. If you do, please tell me and I'll look for another solution to my template. The cutest template, ever! I love it and will use it! Do I have to use photobucket? Wow that is sooo pretty and cuuute. I'll try that one. Hola, baje tu diseño y lo pude colocar en mi blog sin ningún problema, gracias! I there - i love this template and have been using it for some time...but in IE notice my profile and sidebar stuff is all the wya down - any ideas?? I did move the kitty pic around - maybe thats why? hi i love this template, i´d like to use en my blog, congratulation this blog is very important for me. Can anyone help me? I downloaded the file, uploaded all the images (kitty and paw prints) but I can't find the template script file. Plus I am using a Mac PowerBook and don't think I have the Note Pad. So how do I complete the process? It seems like it's missing a lot of stuff. What am I missing? 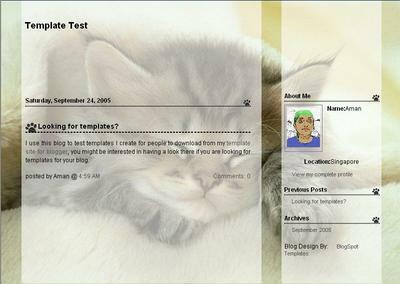 I just downloaded and installed the cat template. Thank you soo much! It is soooo me! You can see it at www.loris-space.blogspot.com. Question - I am an HTML idiot, so you may not be able to explain this to me so that I can understand it, but how can I add links to my favorite places in the side bar? And daily quotes such as the ones from heartlight.com? Many thanks for you help, and thank you again for all of your wonderful templates! Thank you for your amazing templates. I downloaded this template and used it. It was Fantastic!!!. It doensn't work on my blog..aww.. It said that it had some errors..